Heat oven to 425°F. In medium bowl, mix flour, 1/2 cup sugar and the orange peel. Cut in butter, using pastry blender or fork, until crumbly. Add buttermilk, orange juice, pecans and vanilla; stir just until dry ingredients are moistened. Place dough on lightly floured surface; knead 3 or 4 times. Divide dough in half. On ungreased large cookie sheet, roll or pat each half into 7-inch round. Cut each round into 8 wedges but do not separate wedges; sprinkle with sugar. Bake 12 to 14 minutes or until golden brown. Carefully separate wedges. Serve warm. 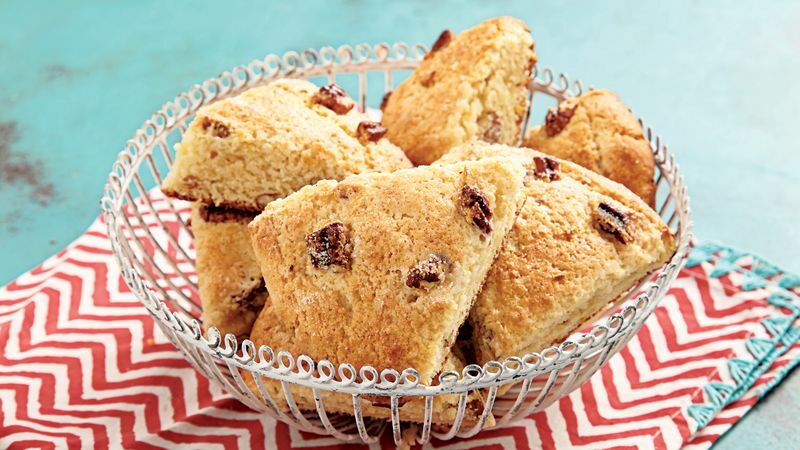 To Freeze: Place cooled baked scones in resealable freezer plastic bag; freeze up to 1 month. Thaw in refrigerator 8 hours. To reheat, place on cookie sheet. Bake at 350ºF for 10 minutes.